As you make your corn management plans this spring, don't overlook the importance of selecting the right planting rate. On-farm research is an excellent way to identify the correct population for your farming operation. In this article, results are presented for 40 on-farm trials. Net returns to planting rate were most commonly maximized at 34,000 and 28,000 seeds per acre for irrigated and rainfed corn, respectively, when corn was valued at $4 per bushel. Figure 1. Sites where corn seeding rate studies were conducted as part of the Nebraska On-Farm Research Network. Nebraska On-Farm Research Network findings showed trial to trial variation in yield response to increasing populations. This variation is likely due to a combination of factors, including soil, climate, management, and hybrids. An interactive tool to view individual yield results by location or year was developed by Nebraska Extension Educator Laura Thompson. You can view the non-irrigated corn population results or the irrigated results. Simply use the buttons on the slide within the tool to navigate. The maximum economic return for the irrigated sites ranged from 28,000 to 40,000 seeds/acre. With $4/bu corn prices, the 32,000 to 36,000 seeds/acre most frequently optimized economic return. Table 1. Location and seeding rates tested for 16 irrigated sites (Figure 1). * These sites had limited irrigation. † Profitability was calculated using seed corn costs of $250/unit (80,000 kernels/unit). When combined across all sites, for each additional 1,000 seeds, 0.7 bu/acre of yield is added (Figure 2). 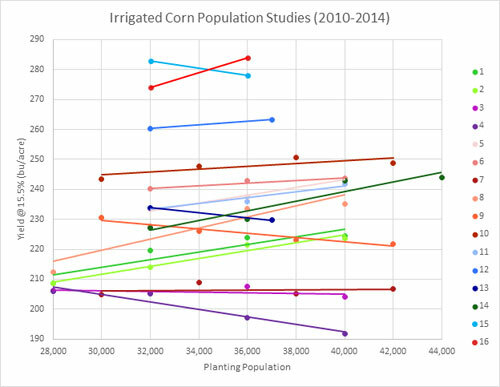 From 2010 to 2014, 24 non-irrigated sites were studied for corn population (Figure 2). Of these, six sites saw significant yield increases for planting populations above 28,000 seeds/acre. Our non-irrigated studies in eastern Nebraska showed we could plant 24,000 to 30,000 seeds/acre. However, yield response to seeding rate varied based on rainfall; in years with favorable growing conditions, some sites saw maximum economic returns as high as 40,000 seeds/acre. Table 2. County location, planting date, harvesting date, and hybrid for 24 non-irrigated corn population research sites. * While not technically irrigated, these sites are located in river-bottom ground with a high water table and may be considered to be naturally sub-irrigated. To see more research results from the Nebraska On-Farm Research Network, visit https://cropwatch.unl.eduresultshome.